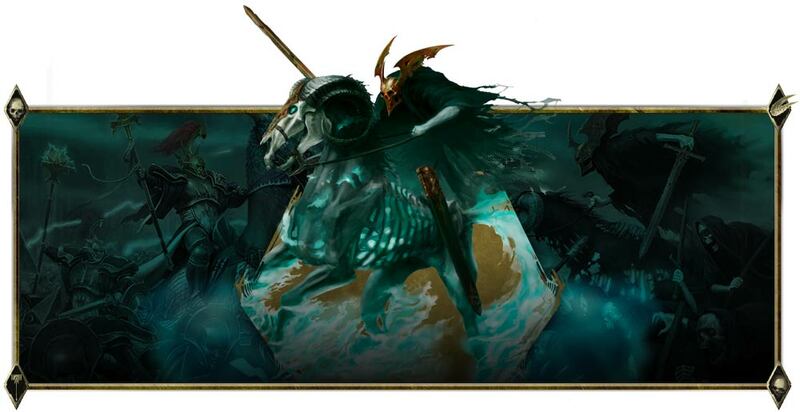 Endless Spells are a literal game changer for Age of Sigmar. We knew that Malign Sorcery was going to bring a ton of new magic and artifacts into the game along with some fantastic new models. And so are the Battletomes! 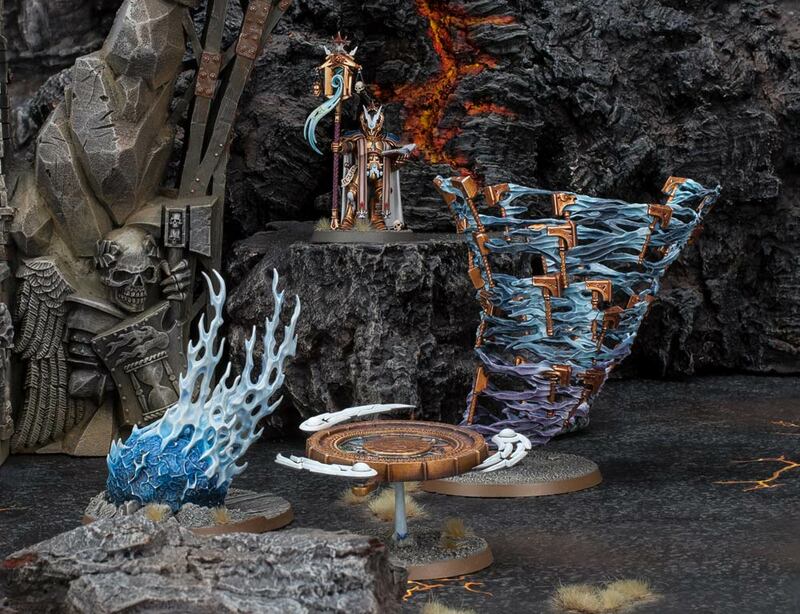 Games Workshop isn’t messing around with magic in Age of Sigmar these days. Malign Sorcery is bringing spellcasting back in a big way. Along with all those fancy new magical items and “regular” spells, we’re also getting a ton of Endless Spells. 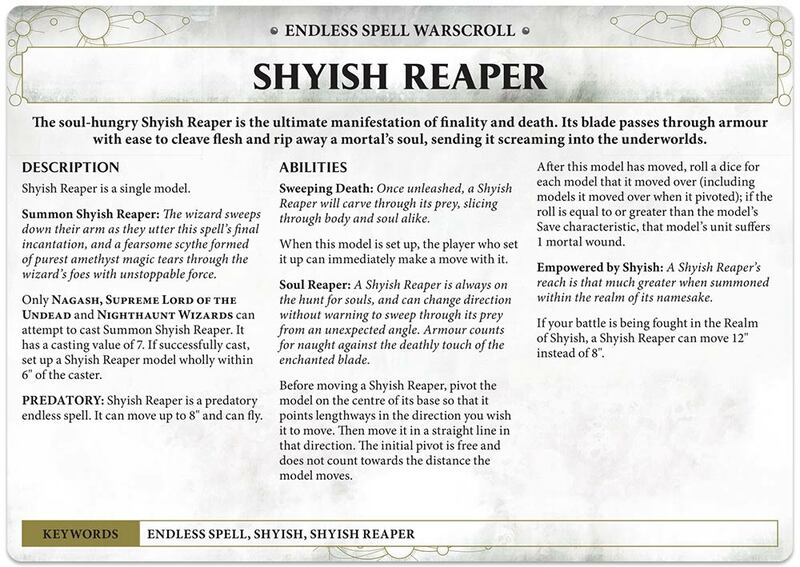 Little did we know that the Nighthaunts and the Stormcasts are ALSO bringing some new Endless Spells with them in their Battletomes. Today, Games Workshop is showing off those models and teasing some of the rules too. I hope you are ready to battle your enemies and their magical friends this time around. The invocations in Endless Spells: Stormcast Eternals are the perfect companion to any Sacrosanct Chambers units you have – with Evocators, Knights-Incantor and Lord-Arcanums, you’ll be spoiled for choice for who to cast them with, and each features powerful in-game effects for you to harness. The Dias Arcanum is a fancy way to fly around the board. 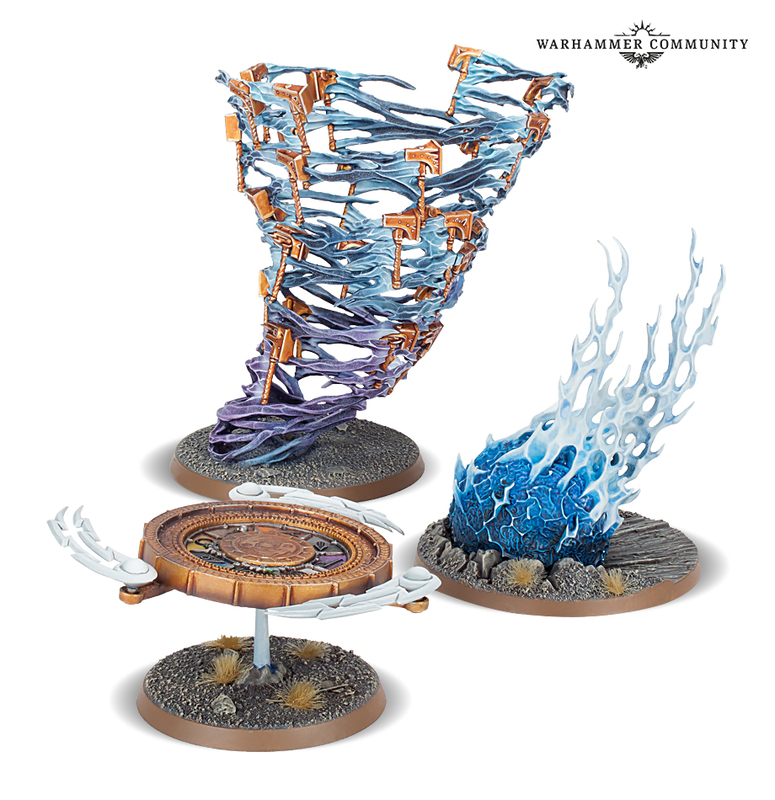 Not only does it provide a lift to those who ride it (like your new Stormcast Wizards) but it also boosts their saving throws. On top of that, the Dias Arcanum grants you an extra Unbind attempt in the Hero Phase. Take that Tzaangors Skyfires – you’re not the only ones who get to fly around on Discs! This spell is MEAN. First off, you can drop this spell 36″ away and that’s a big deal. Why? Because that would place it outside the new unbind range of 30″ so you can drop it uncontested. Secondly, when it does hit, it can generate a massive amount of Mortal Wounds. That would be bad enough, but it can KEEP doing Mortal Wounds at the start of each battle round. 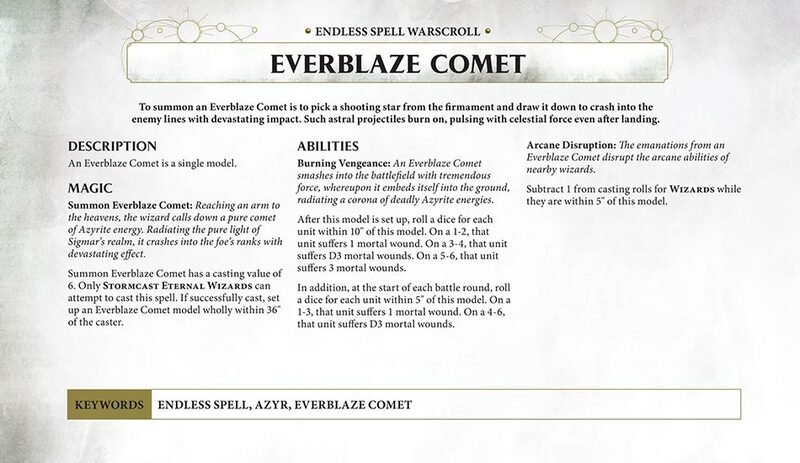 Finally, it also causes Wizards to get a -1 to their casting rolls if they are within 5″ of the Everblaze Comet. 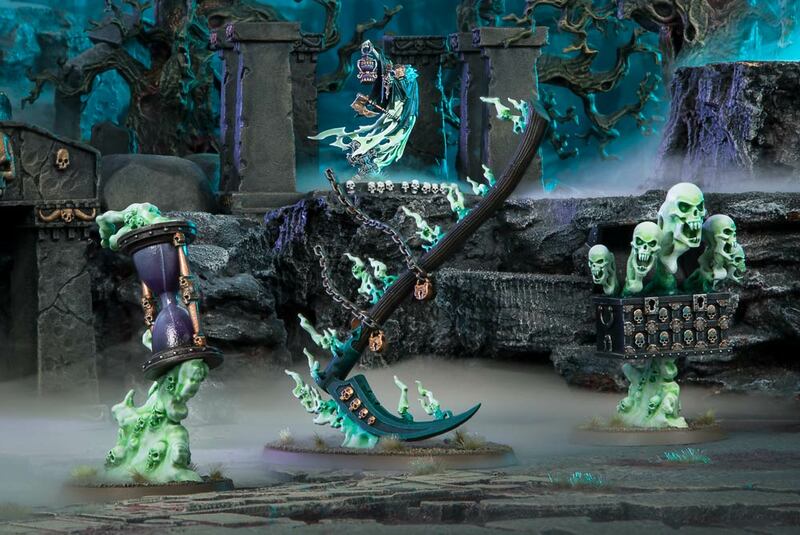 The Nighthaunts are getting few spells of their own. All of these are infused with the power of Death and in the right hands can really do a number on the enemy’s battleplans. It’s going to move around the table and cut stuff up! The better your armor save, the worse it is for you as well. Next up is the new Vault of Souls. This Endless Spell not only causes damage to nearby models, it can also detonate for more damage later! 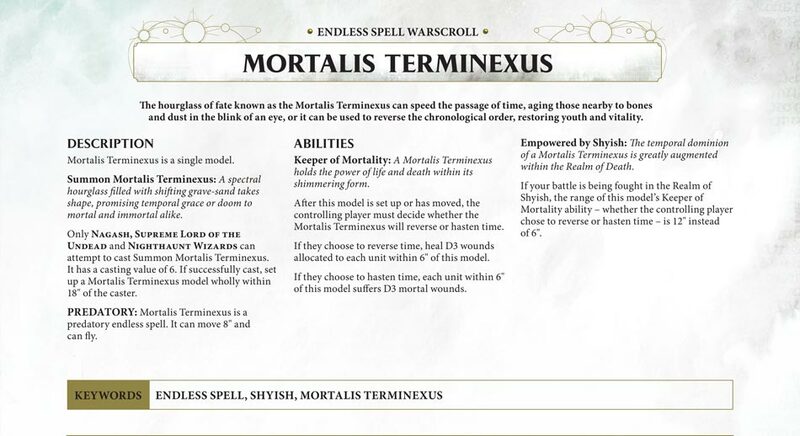 And finally, we get a look at the new Mortalis Terminexus. This spells messes with time and consequently the units around it are impacted by all the fluctuations. It’s a versatile spell for sure as it can heal units that have died. Conversely, it can also cause that rapid aging to kick in and really grind units down. All these Endless Spells are coming along side their respective Battletomes. Get ready for some more magic in the Mortal Realms!